A healthy but vulnerable population of Eragrostis paupera occurs on the runway where shallow root systems stunt the growth and ability to withstand long periods of dry weather. Three other small populations occur 1) 20’ feet north of the NMFS 2/3 border, 2) north point, 3) 500’ north of the 2/3 border. The dune plants were considerably larger than the stunted runway plants. There are two other historical sites 100’ north of the Booby Acres entrance, and the NMFS sector 1 in the dunes, 200’ south of the 1/2 border but, these areas were heavily impacted by severe winter weather and the 2011 Japan tsunami. In sandy environments, they can grow up to five times larger than on the runway. They are a dynamic plant for the runway in that they can thrive in that tough environment and form this solid mat. The birds really like it for nesting as they rip it all apart and make a nice little nest while spreading seeds in the process(!). The restoration strategy for this plant is to find places that protect it—has a good buffer around that plant and others—so it can make a good stand and be sustainable. One of these areas is in the dune structures. 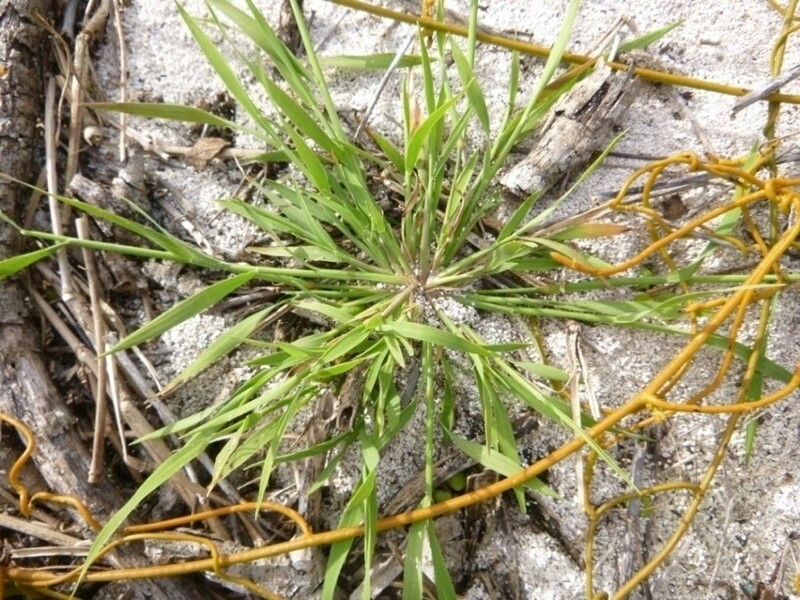 In particular, there is one spot along the vegetation on the shoreline where there is a huge stand of it and it is a place with very little competition against other plants as well. This plant, along with Fimbristilis stylis, is a key plant in the nursery for replanting in areas with hard substrates like the runway or old roads like the one left by the coast guard in the central part of the island where there was once a Loran tower.